Look at James Shields‘ stats this year and you might get a David Wooderson vibe. He keeps getting older and his stats stay the same. This year, the 33-year-old is even at career highs in ways that tend to become meaningful quickly. Some of it is about staying the same, sure, but there have been a few wrinkles along the way. One thing that hasn’t changed for Shields is his dedication to the arm and shoulder exercises that he learned in Tampa that have stuck with him to this day. He admits, like Jesse Hahn, that other teams have developed similar routines by now. “I just grew up with that organization,” Shields pointed out. “I was there in 2000, so I watched it evolve into the type of arm exercise program they have there now, and they’re very thorough and they do a great job.” Shields leads the league in games started since his first full year in the league. He’s second in innings since 2007, too. He also still throws that same old changeup. The catch phrase is that it’s the best right-handed changeup in the game, despite evidence that it’s not any more. A bigger velocity gap is good for whiffs on the change, but his keeps getting harder. Shields shrugs it off. “I’m not really a big believer in how fast my changeup is going, I’m more of a believer in how much it moves,” he said. “I think movement means more than anything.” To some extent, he’s right — fade and drop are good for your change no matter what the velocity differential is. The Best Right Handed Change in the Game? “I’ve never had the speed differential changeup — I rely more on my movement,” he said, and there, he’s completely right. Convert his movement and velocity differential to indexed numbers (where 100 is average), and you can see that his fade and drop were always the best facets of his changeup. 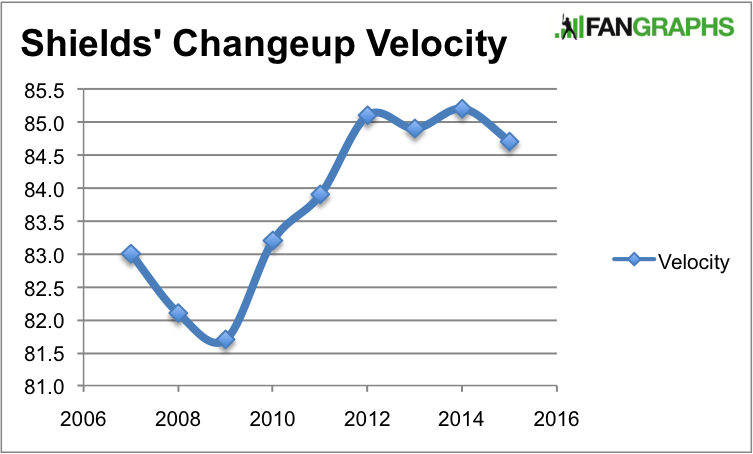 What you might also see when you look at that graph is that his changeup is also not as good as it used to be when it comes to movement. Age comes for all of us, even Edelbrock intakes, so at 33, Shields’ change isn’t quite what it was. So this is a little weird. Look at his whiff rates on his pitches, by year, thanks to Brooks Baseball. He’s thrown 151 changeups already this year, and he’s gotten more whiffs on the pitch than ever. After I offered that maybe he’s just enjoyed striking the pitcher out, Shields wasn’t so sure: “The pitchers have actually hit pretty well against me, so I don’t think it’s that.” Funny thing about memory, though. One pitcher hits a double off you, and you think they’ve done okay. Despite the .083	/.154/.167 batting line they’ve put up, and despite the seven strikeouts in 14 plate appearances. Still, take away every strikeout Shields has thrown to a pitcher this year, and he’s still struck out 29.1% of the batters he’s faced. His previous career high was 23.6%. “Let’s just wait till the end of the season till we start talking about that,” laughed the pitcher. But he’s doing very well this year, and not everything is the same as usual. Look at his non-fastball pitching mix over the years. So how does the situation change so much that you end up throwing your second- and third-best pitches more than your best pitch? “The game evolves,” Shields said. “Everyone around the league knows I have a changeup. Sometimes, if you see the guys are sitting on it, you’re going to throw other pitches.” Last year, batters were swinging at his changeup less than ever, so he turned to the cutter more often. 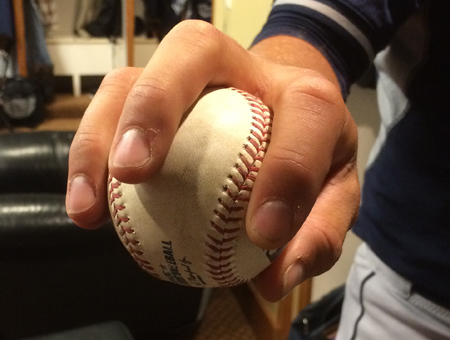 Shields throws a four-seam cutter grip, with the seams offset. Now that one of every five pitches is a cutter, it was worth asking him what he thought of the whole “cutter robs velocity” thing. “I’ve gained velocity the last four years. Last year was the highest I’ve ever been and I threw more cutters than ever,” he said. But he keeps his fingers apart, as you can see above, and agrees that if you put them too far together, you can get around the side of the ball. But this year might be more about the curve than the cutter. “The last game I think I threw more curveballs than changeups — I’m throwing my curveball a lot more,” said Shields, “and I’ve been striking guys out with it.” For his career, Shields has thrown four changeups to every curve in two-strike counts. This year, he’s thrown them almost equally. Considering that the change is the pitch with the healthiest outcomes — changeup-heavy starters have an 34% chance of going to the Disabled List in any given season, compared to 40% for the general population — and he throws the ‘healthy’ cutter, maybe it’s significant that Shields’ breaking ball is a knuckle curve. 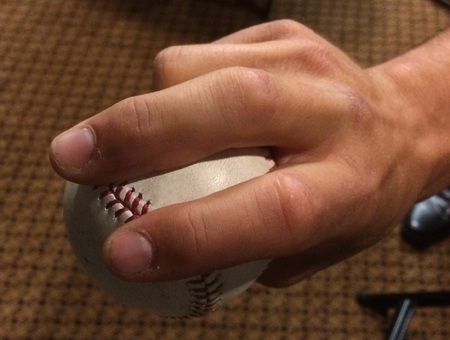 Shields uses a spike curve grip but doesn’t dig the fingernail into the seam. James Shields is also top 25 in the league in walk rate over the course of his career. That makes him a strike-thrower, which Jeff Zimmerman showed is good for your health outcomes. All right, all right, all right — put it all together and you see that he’s in all the right buckets for health. The fact that James Shields always had two other pitches behind his changeup has also become more meaningful as the league has started to sit on his changeup. At one point in the interview, Shields laughed and asked “Am I getting the sabermetric rundown?” Maybe, I said. And then I assured him that the the numbers were in his favor. 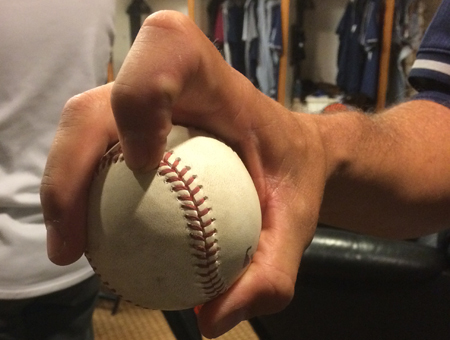 We hoped you liked reading James Shields on his Changeup, Longevity, and Age by Eno Sarris! Great article. 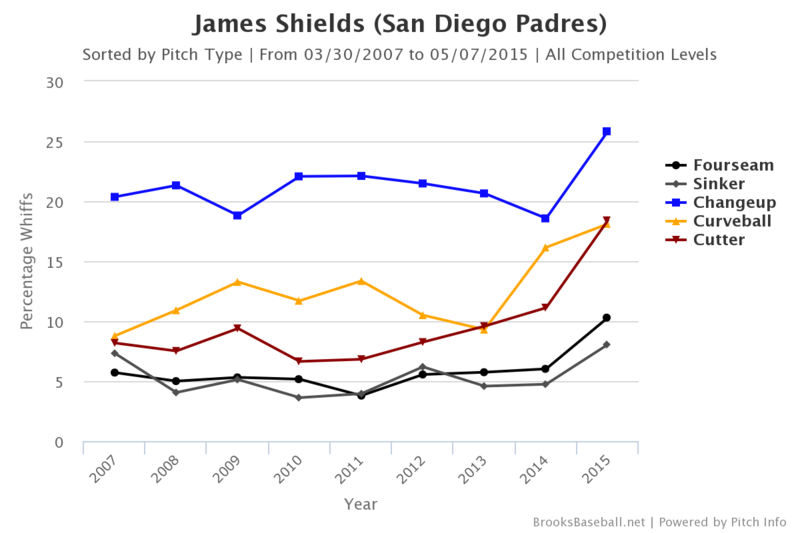 I wonder how Shields’ numbers will stack up at the end of his career. He’ll probably be in the Hall of Very Good, definitely a career to be proud of. The formula for WAR is not written in stone. 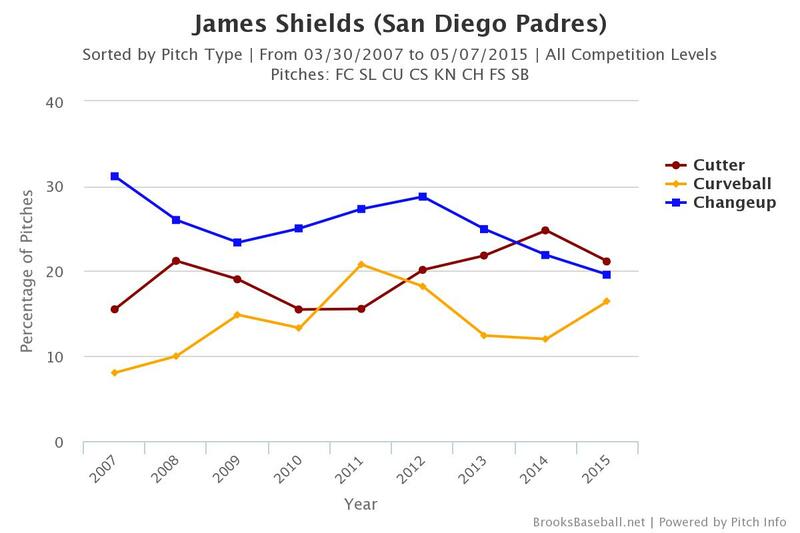 It may well change before Shields retires, and the past seasons would have to be recalculated. 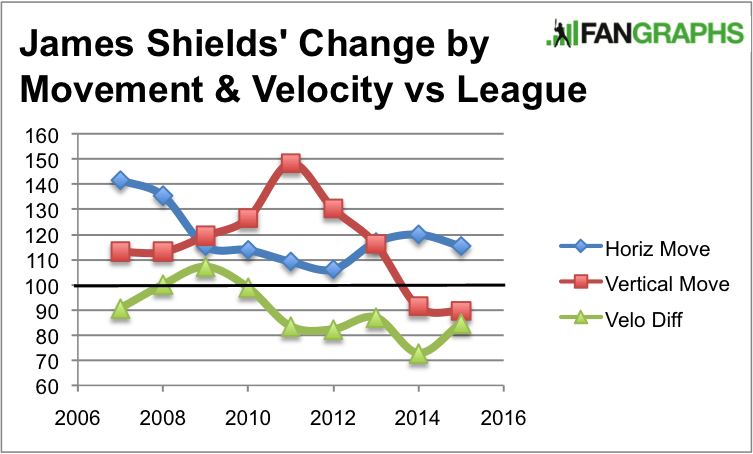 I’ll guess the formula will be refined and Shields will benefit.